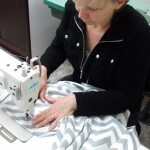 What's happening at Lisa Sinclair Sewing - a new ottoman! It’s been a dreadful winter – we still have a few months to go. So, why not try snuggling up with a movie and resting your feet on this cozy creation – a faux fur Mongolian goat ottoman. Courtesy of the ever talented Kerry McRorie from Well-Nested Interiors. Isn’t it darling. Hang in there, spring will come soon and this snow will be forgotten! And, plan ahead for some outdoor furniture so it’s ready – if outdoor cushions need new covers, let me know. 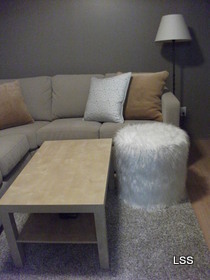 A fun new project – a faux fur ottoman for Kerry McRorie at Well Nested Interiors!